Something out of a fairy tale: medieval style timber buildings, cobblestones & a dusting of snow like confectioner’s sugar- the marvelous Christmas market of Strasbourg! My university exams finished late this year and so up until yesterday, I had yet to deck the halls. Every year I like to have a weekend trip in Europe before heading back to the United States for the holidays. Given my craving for the spirit of the season I decided on Strasbourg, which is known for not one but four different Christmas markets. Located in Alsace, the charming city has French & German influences making it a combination of all things merry. Scents of mulled wine & apple cider in the air. Treats to warm the heart, from streusel to pain d’épices,. All of those spiced flavors that make the season delicious. Sunday saw families crowding the markets, everyone admiring the dazzling lights strewn about. This morning we woke up to snow, which did indeed stick to my nose & eyelashes. 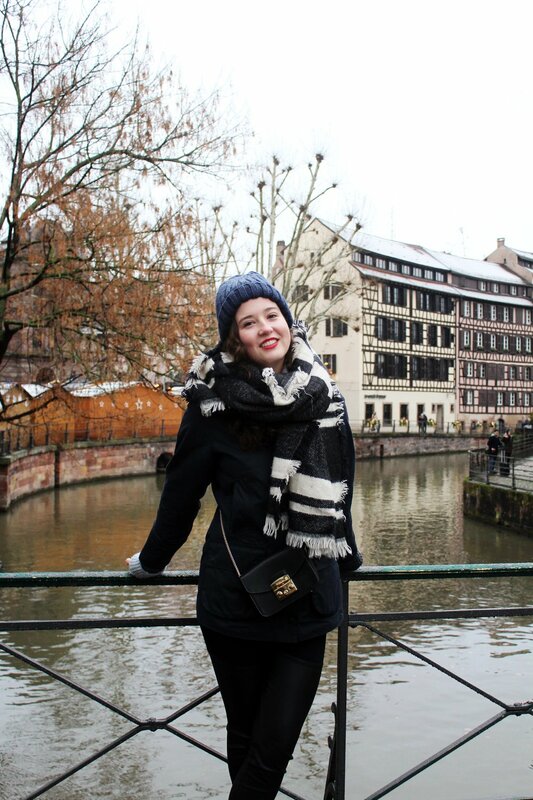 Between the wind off the canals & the snow I was somewhat unglamorously bundled up- hat & blanket scarf a necessity. But even with my impressive hat head, I couldn’t stop grinning. A town like this, with lovely friends truly does make you believe in the magic of Christmas. Next Post What Are You Wearing On New Years Eve?